Quirky NY Chick: Illinois At Mercury Lounge Tomorrow! Those men known as Illinois will be tearing it up at Mercury Lounge tomorrow, May 5. 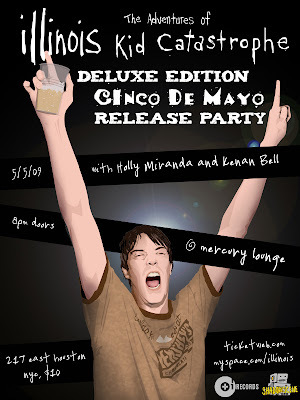 Yep, that's right, celebrate Mexican holiday Cinco De Mayo, in NYC with a band from Pennsylvania that carries the name of a Midwestern state. It's the great American melting pot! The show will also serve as a record release party for the deluxe edition of their record The Adventures of Kid Catastrophe. I caught Illinois last November, they're a good band so if you get the chance, go check them out. And for those who can't get enough of Illinois, they've done a new Daytrotter Session.